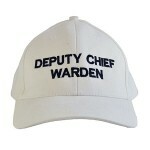 Our Embroidered Caps are a very cost effective way to purchase identifying caps for common roles and requirements. Whether on a worksite, a road crew, or staffing at an event, you’ll find what you're looking for in our range of caps embroidered with a variety of titles. All our Embroidered Caps are manufactured right here in Australia and are made from 100% high quality cotton to keep you cool and comfortable. They are fully adjustable so they'll fit all sizes. 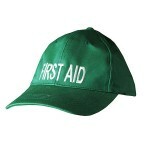 Our Embroidered Caps are designed to compliment our range of PRINTED SAFETY VESTS. Purchase both at the same time for a complete look and combine them into a single order so you save on shipping. 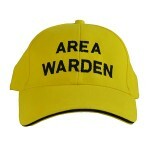 Area Warden Embroidered Cap Designed in all natural 100% cotton so you'll stay cool and comfortable, this cap comes embroidered with the text AREA WARDEN on the front in solid black lettering. 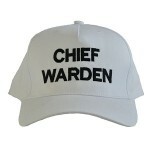 Avai..
Chief Warden Embroidered Cap Designed in all natural 100% cotton so you'll stay cool and comfortable, this cap comes embroidered with the text CHIEF WARDEN on the front in solid black lettering..
Deputy Chief Warden Embroidered Cap Designed in all natural 100% cotton so you'll stay cool and comfortable, this cap comes embroidered with the text DEPUTY CHIEF WARDEN on the front in solid black ..
First Aid Embroidered Cap Designed in all natural 100% cotton so you'll stay cool and comfortable, this cap comes embroidered with the text FIRST AID on the front in solid white lettering. Availabl.. 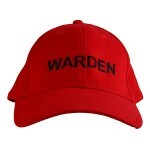 Warden Embroidered Cap Designed in all natural 100% cotton so you'll stay cool and comfortable, this cap comes embroidered with the text WARDEN on the front in solid black lettering. Available in r..